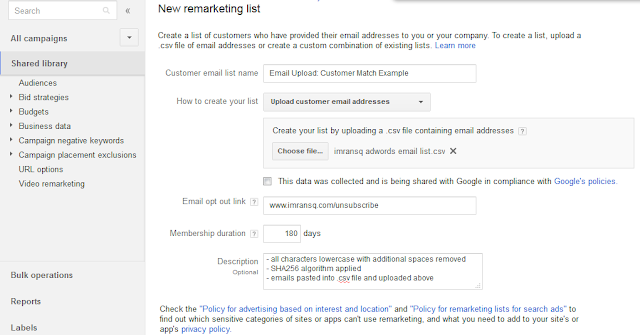 A few weeks ago Google launched Gmail ads in the AdWords interface, shortly after that they pushed out the ‘Customer Match’ feature allowing advertisers to upload email databases into their accounts – arm yourself and learn email marketing via adwords skills to add it to your advertising options or service solutions in under 5 minutes below. Similar Audiences upload a list of your current customers, and AdWords will multiply the list with other users, who match your customers. Thank You, Come Again upload a list of your buyers and offer them discounts that only those who can see your ads can see. Close Deals upload a list of email addresses from loyalty schemes, newsletters, other sources and control advertising cost by only paying for those you want, to see your ads. A New Voice you CAN NOT create a bespoke, personalised ad message for someone and indicate you knew you were targeting them. Ha, the thought of it is funny though. 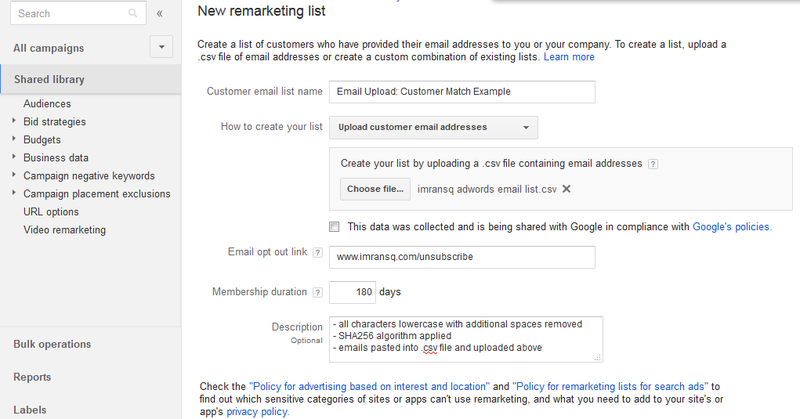 Customers Matched: emails will be matched to Google accounts, cookie ID's will then be created for those users. Cookie Lifespan: cookies for search can be collected for a max of 180 days only (the work around is to send user to a page and optimize an independent remarketing list to re-collect customer matched traffic). Hashing: apply the SHA256 algorithm to email list; remember to set to lowercase and remove any additional spaces beforehand. Limitations: only attempt to upload files in .csv file format with max file size of 17MB. Don't Mess About: if you breach any of the customer match policies you might bump into a Google Compliance Review, and if your a multi-account manager - your other accounts might also then get contact to be reviewed! Point being - 'big brother' won't let you get away with using a database of users that you bought or collected using dodgy methods. Try this, find any HTML email and view the web version of that mail, right click and copy the source code - I will show you where to paste it after the next step. 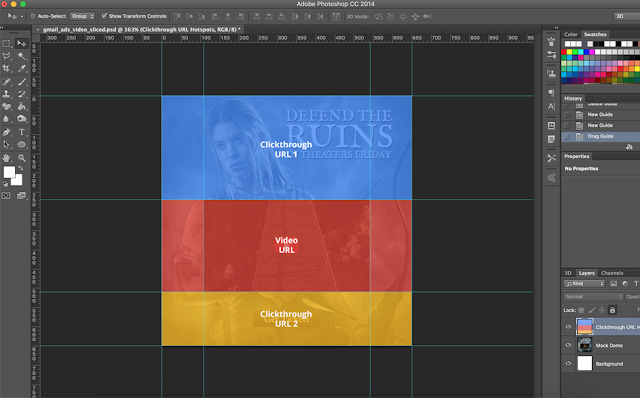 Visit the Rich Media Gallery for a list of templates that you can edit inside tools like Photoshop and GIMP. If you are anything like me, editing ads in Photoshop and GIMP is really good for some - but I was only curious to know how ads are create in photo editing tools, which you can do in the this build guide - I was not interested in learning how to create them myself. At this point you would need a proper graphics designer or opt for one of the other ad formats provided in the ad gallery - but we have three minutes left now, so go ahead and quickly download one of the gmail templates from the rich media gallery, or right click and grab the source code from the web version of a HTML mail sent to you. We can catch up at the next step when you get back. 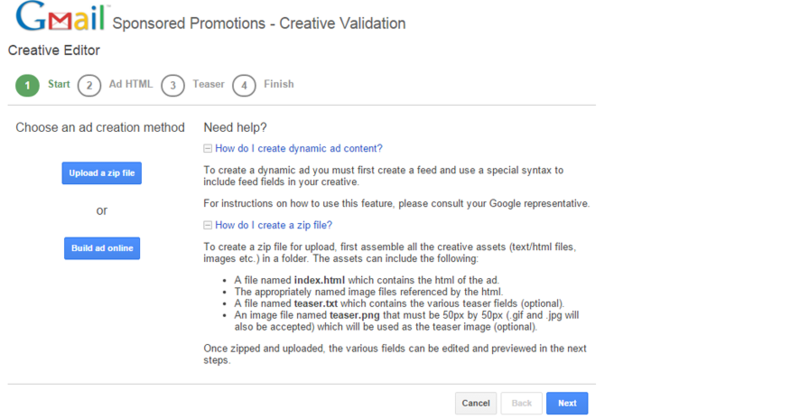 By now, you should know where to upload the ad at point of completion in AdWords ad gallery, skipped passed all the jibber jabber on other gmail adformats, downloaded a template from the link I gave to you or about to toying with a HTML source code that is ready in your clipboard. Before previewing the file, you will need to click on validate ad, at which point the tool will clean up your source code, point out errors or successfully allow you to see how the ad will look. The creative editor will then proceed to walk you through the components needed to build a full Gmail ad and push out a zip file ready for the adwords ad gallery. Instructions for CSS and actual no-test versions of HTML ad creatives are available online for you to use or send to design teams. Click To Call & Form Submit: both options are disabled until you contact Google who hapilly unlock it for you. 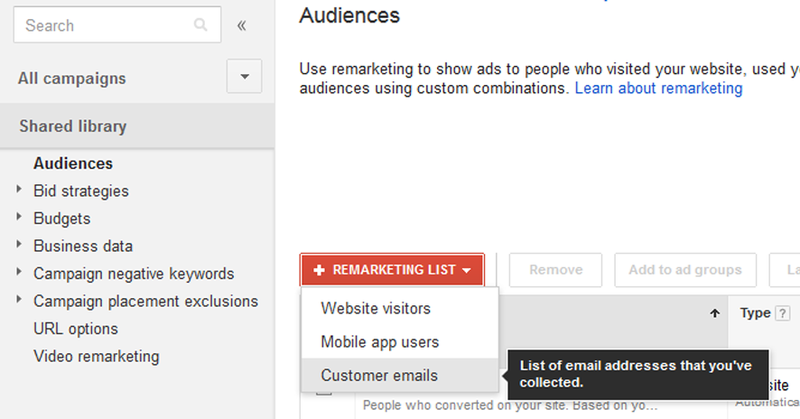 Targeting Options: do not yet include remarketing and in-market audiences. Contextual options, demographics and affinity audience do work (i.e. so you can target conversations and domains if you wanted). White Spaces: if you keep seeing white spaces between images, add this [style="display:block;"] to all the images. Limitations: 15 destination URL's, 5 forms, 5 click to calls. 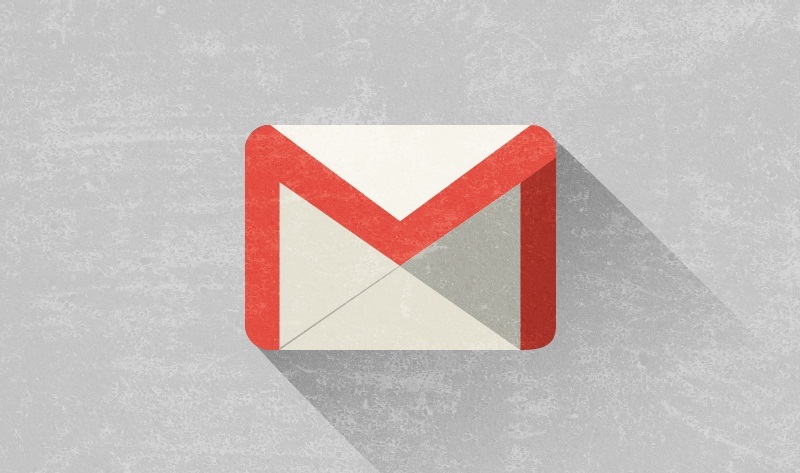 Hopefully you now have some idea on how easy it is to upload email databases, or use the new HTML ad format for Gmail ads - alternatively you should bookmark this page for another day and I hope you will thank yourself for it at the point of needing to get started with email advertising via adwords. Imran Sq once worked at a UK Google Support team and had the learning opportunity to support thousands of diverse adwords campaigns and hundreds of digital agencies. Moved up the ranks of product knowledge to train the departments new/existing local/national sales, optimizer and management teams - some of his trainees went on to successfully fill 'head of digital' roles whereas he went on to run his own consultancy. Follow him on Google+.